Diwali is an annual festival which is celebrated across the country. We forget how Diwali fireworks badly affect air quality on this day. This is the “festival of lights”. When this festival comes, everyone always thinks of fireworks and lights in the night of Diwali. At the end of the day, the level of air quality suddenly changes. The air of the city is filled with full of smog. Even though it is a day to celebrate happiness on this day, the way that we celebrate with many fireworks is threatening the environment. Air pollution is responsible for between 10,000 -30,000 deaths every year in Delhi alone. It is estimated that every year, 620,000 deaths occur in India due to air pollution related diseases. The fireworks of New Delhi’s festival of lights have faded and turned the air thundercloud-grey, bringing record levels of pollution to one of the world’s most densely populated cities. 2016 Diwali marked one of the worst air pollution levels in India. The level of particulate matter pm.25 and pm10 were up to double more than the figure of WHO’s recommendation, causing several health problems and diseases due to just a few days of celebration. Delhi air pollution is likely to increase after October, 2018 and set to peak after Diwali. Air pollution in the national capital is likely to peak from November after Diwali because of toxic fumes from the stubble-burning regions of Punjab and Haryana, and fireworks of Diwali. The air quality in Delhi has already been very poor on the air quality index (AQI) and is likely to deteriorate further, according to predictions by the Central Pollution Control Board’s (CPCB) forecasting system. The air quality of Delhi after Diwali 2017 was better than 2016 because of ban on selling of firecrackers. According to Centre for Science and Environment (CSE), level of PM2.5 2017 Diwali was lower than Diwali 2016. Pre-Diwali pollution of 2017 was also lower than the pre-Diwali pollution of 2016. The pre-Diwali pollution of 2016 had already hit the severe level (4.9 times the standard). Whereas in 2017 year, it remained within very poor category (2.9 times higher than the standard). Even during those days after Diwali, night-time pollution was three to four times higher than day-time pollution in Delhi and NCR cities. We breathe toxic air after Diwali and then, it results wheezing, difficulty breathing and coughing. Some of the health risks and diseases associated with air pollution include respiratory infections, lung cancer, heart disease, stroke, etc. The toxins are absorbed into our bloodstream and affect cardiovascular health. Children under the age of five are most at risk of facing health problems due to air pollution. Even though we all know the side effects of air pollution, we in India are not yet ready to take precautions and preventive measures against air pollution. 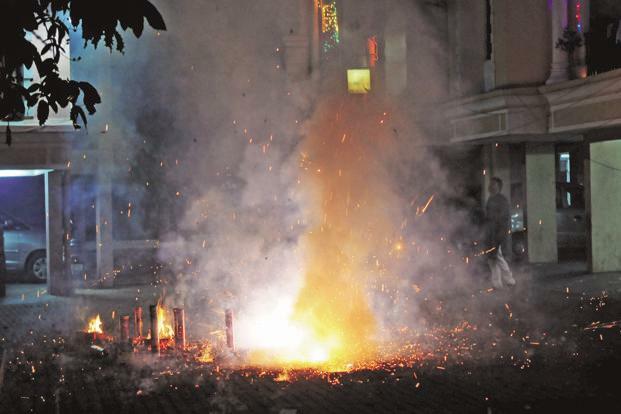 While Diwali is a fun and good day of occasion, using fireworks like firecrackers must be reduced at most. It is a very important concern about you and your family health. If you want to protect you and your family from air pollution, wearing an anti-pollution mask will help you breathe clean air. It will also prevent from breathing toxic air during the bad air quality while you are away from your house. While you are safe in outdoor by wearing anti-pollution mask, you are still in risk in indoor. Indoor air pollution is as dangerous as outdoor. It may be even more worse than outdoor air pollution. Take care of yourself and for your family members while the air quality is very bad, mostly after Diwali. Let’s spread this message to everyone about the danger of air pollution after Diwali against using fireworks / firecrackers.